2nd March 1945 Raymond Mays launched the appeal to form a British cooperative to design, build and race a national Grand Prix car. 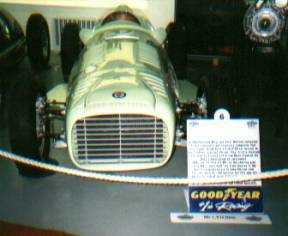 1946 Peter Berthon with Eric George Richter designed a V16 engine expected to produce 500bhp at 12,000rpm. July 1947 The British Motor Racing Research Trust formed. 15 December 1949 The completed BRM V16 P15 car was presented to the world at Folkingham airfield, near Bourne. Just a minute, you may say. How come a racing car takes four and a half years to build? Britain may have been victorious in the Second World War but the cost in every way was massive. Into the early 1950s basic foodstuffs were still rationed and specialist engineering materials were reserved for the Export Or Die production campaign required to deal with the astronomical National Debt. The BRM co-operative was a sideline to the companies battling to rebuild after the war and suffered as a consequence. 1950  the start of the Formula One World Championship. For 1.5 litre supercharged cars (like the BRM V16) or 4.5 litre un-supercharged cars. 26th August 1950 Daily Express International Trophy Two cars were entered (for Raymond Sommer / Peter Walker and Raymond Mays / Reg Parnell). After pre-race problems only one car was at the start and that one at the back of the grid after missing official practice. The renowned French champion, Sommer, never left the line due to drive-shaft failure. A shaft for the inner universal joint of the half-shaft had failed due to the steel not being to specification. Woodcote Cup One car was entered for the 5 lap race. Reg Parnell led the race from start to finish and won the rain soaked race at 78.5mph. Goodwood Trophy Parnell again drove the single entry in the 12 lap race. After a race-long tussle with the Maserati of B.Bira, Reg came home first at 82.48mph. 29th October 1950 Spanish GP, Barcelona Two cars were entered for Reg Parnell and Peter Walker with Ken Richardson as reserve driver. Walker stalled at the start  retired from 5th place on lap 35 due to a gearbox oil leak. Parnell left the grid very slowly  but finished the first lap 4th. having passed 17 cars during the lap!. After one more lap retired - supercharger drive shaft snapped due to a faulty ball race. Two new cars built for 1951 with better brakes, steering and fuel tanks. 14 July 1951 British GP, Silverstone Problems with the cars resulted in practice being missed. Two cars (Reg Parnell and Peter Walker) started. Both drivers suffered from burns due to heat of the exhaust system and also fuel fumes entering the cockpit. Not unexpectedly, at the planned single pit stop both drivers failed to clear the airlocks between the front and rear fuel tanks (a valve on the connecting pipe should have been opened). A second (unplanned) stop was needed to top up the tanks. Parnell finished 5th and gained BRMs first World Championship point. 16 September 1951 Italian GP, Monza Two cars entered for Parnell and Hans Stuck (a late replacement for Ken Richardson, who was refused a licence at the last minute). Due to a multitude of problems the cars did not get any sustained high speed running until the morning of the race. 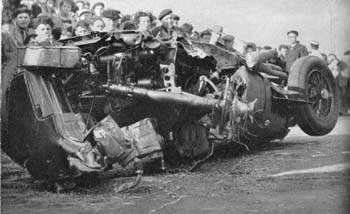 It was discovered that the gearboxes were overheating and were at great risk of seizing. A brave decision was made to withdraw the cars to protect the drivers from the possibility of a catastrophic accident. The crowd (and the British press) were not best pleased. 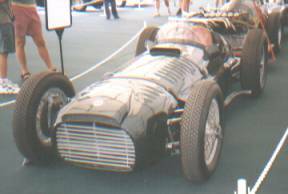 1952 The BRM V16s biggest defeat was suffered, not at the hand of a rival team, but due to the governing bodys decision to cut short the life of the then current regulations and run the F1 World Championship to F2 rules (2 litre un-supercharged). The team were left with a car reaching competitiveness and no Championship to race it in. 1st June 1952 Albi GP, France. Juan Manuel Fangio & Froilan Gonzalez both started from the front row of the grid. Gonzalez was out after 5 laps in second place.  overheating. Fangio was out after 16 laps in the lead.  water leak & overheating. After a rush via air transport  Fangio missed official practice and started from the back of the grid despite recording the fastest lap during unofficial practice  Stirling Moss got no practice at all and also started at the back. Moss stalled at the start and was out with clutch problems. Fangio was in the pits at 15 laps with a blocked fuel filter and was out for good 10 laps later. Cars had been changed from light green to dark green. More importantly bigger radiators and water pumps were fitted. Gonzalez was fastest in practice but early on ran wide at Stowe while in second position and rejoined the race with a fence post through radiator. As may be expected, the car was retired on returning to the pits. Gonzalez took over the car of Ken Wharton (then in 5th.) With 3 laps to go, having moved up to third, this car was also retired when the gearbox input gears failed. Wharton was in a good position until the gearbox input gears failed. Cars fitted with enormous fuel filter. Reg Parnell won ahead of Ron Flockart in ERA R4D. Wharton retired  broken steering joint. Woodcote Cup  Gonzalez first / Parnell third / Wharton did not start as he had run the fuel system dry forming up for the grid. Goodwood Trophy Gonzalez first / Parnell second and new lap record / Wharton third. Parnell  retired, gearbox input gears failed. Wharton took the lead from Bob Gerrard (ERA 2 litre) then spun due to a grabbing brake and was back to second, got back into the lead, spun again and finished second. 23 October 1952  the trust accepted Alfred Owens bid to buy BRM. Chichester Cup  5 laps in the rain. Wharton was second, Parnell fourth. Glover Trophy - Main race 15 laps almost dry. Parnell led until retiring with supercharger drive quill-shaft sheared on lap 4. Wharton won and set new lap record. Wharton spun and finished third with a new lap record. The event was to be run as a heat and final. In practice Gonzalez lost a tread due to high speed & hot weather, the team swapped from 17in to 18in wheels. Heat 1. Fangio lead from the start. After the two Ferraris were out with engine trouble BRM were 123. Gonzalez lost another tread and required a pit-stop. The result was Fangio first, Wharton second and Gonzalez fifth. Main race For the final Gonzalez was on 18 wheels with Fangio & Wharton on 17 wheels and all told to take it easily. All took off in the lead. Lap 8 Gonzalez was in the pits with thrown tread. Lap10 Fangio was out with stripped tread  hit wall  broken wheel hub. Wharton in lead but later left road and destroyed the car against a house. (engine and gearbox reused  chassis later rebuilt as lightweight Mk2  P30). Gonzalez pitted again with 6 laps to go with another thrown tread but still finished second. 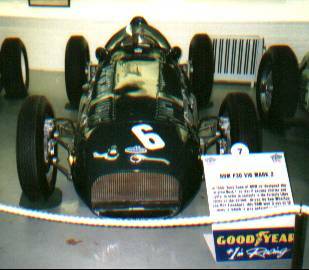 Fangio was second after engine problems in practice and race. Wharton came home third. Parnells rear brakes locked in practice and the car rolled over. The driver was unhurt but the car was badly damaged and missed the race. Wharton won the race and set a new lap record. Woodcote Cup 5 laps. Fangio came second, with Wharton third. Goodwood Trophy 15 lap. Wharton came home second but Fangio retired due to a broken gearbox. The team decided to rebuild the Albi crashed car as a lightweight, known as the P30 or V16 Mk2. The improved car was 6in. shorter than the original car and the fuel tankage reduced to 42gal. from 72 gal. Weight at the starting line reduced from 2128lb. to 1960lb. Wharton led for most of race (ran out of fuel or fuel line problems) and pushed home for the last 300yds. to finish third. Chichester Cup 5 lap was won by Wharton in the first Mk2 with Ron Flockhart fourth in a Mk1. Glover Trophy 21 lap - Wharton took over the Mk1 and won but badly bent the chassis in a coming together with Salvadori in his Maserati. Flockhart took over the Mk 2 with a misfire and came home fourth in the last race of a Mk 1 car. 18th May 1954 The second Mk 2 was completed. The Mk2 cars were also known as No. 4 and No. 5. Heat 1 - Wharton fourth. Heat 2 - Flockhart won. Final - Wharton spun off and Flockhart was third after losing 90 sec in a spin. Flockhart led for the first 3 laps of the 15 and came home second. Wharton was fifth. Flockhart only managed the first lap due to a stone in the carburettor. Wharton used car No. 4 (usually Flockharts) to finish second. Flockhart had spun on first lap and was out. Wharton was second in practice with Flockhart fourth. In the race Wharton was out after a collision - but shared fastest lap. Flockhart finished third with plug trouble. Chichester Cup Peter Collins  V16 Mk2 won and set fastest lap. Handicap Race - Collins classified fifth (first on the road ?). Peter Collins had a 15 sec. lead after 6 laps but after a coming together with a back marker and was out. Flockhart was second. Collins retired with a broken drive shaft universal joint. Some will say that the BRM V16 was a failure. As a car intended to take on the World at the top level of motor sport, only one World Championship point is not a dominant performance. (That would come after another ten years hard work.) The Formula One 1.5 litre rules were abandoned as the car was reaching maturity. The car did have a successful career away from the spotlight of the World Championship as the following results show. Front track 52in. Bore 49.53mm. Rear track 51in. Stroke 47.8mm. Width 56in. Power 600bhp. @ 12,000rpm. Frontal area 9.5 sq. ft. Weight (start line) 2,128lb. (525bhp. per ton) Driveline Jointed propshaft angled to pass on left of driver to ZF limited-slip differential. Front suspension Independent via trailing arms with Lockheed air struts. Steering 2.5 turns lock-to-lock via worm and nut steering box. Wheels Dunlop centre-locking wire wheels. Width Power 600bhp. @ 12,000rpm. The Donington Grand Prix Collection BRM V16 Mk.2 No.2 (or V16/05) at RaceRetro 20th February 2015. Jose-Froilan Gonzalez at the wheel during the Coys International Historic Festival's BRM 50th. anniversary celebration. Silverstone 31/7/1999. V16 Mk.1 The P15 was the original BRM. 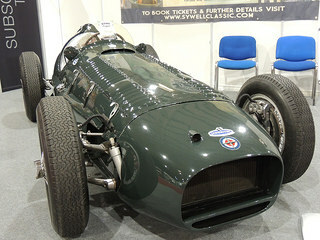 The National Motor Museum Trust is looking to raise funds to preserve our iconic 1950 BRM V16 1.5 litre Type 15. Written off in 1953 at Albi - but now at Donington! V16 Mk.2 The P30 was the improved version of the original P15 BRM. The mark two was shortened and lightened. In 1999 with Nick Mason's "Ten Tenths" company - now with the collection of Bernie Ecclestone.